Functional bioinformatics is a part of computational biology that uses the enormous wealth of raw data derived from genomics, transcriptomics, proteomics, glycomics, lipidomics, metabolomics and other large-scale “Omics” experiments to decode the complex gene and protein functions and interactions in health and disease. Importantly, the number of publications in the area of functional bioinformatics has been increased in the last 20 years. In functional genomics, the roles of genes are identified using high-throughput technologies such as the microarrays and next-generation sequencing (NGS) approaches. Functional bioinformatics decodes how genomes, proteomes and metabolomes result in different cellular phenotypes and analyses differences in how the same genome functions differently in diverse cell types and how changes in genomes alter both cellular and molecular functions through differential expression of transcripts or genes (DEGs) which in turn regulate the expression of proteins and metabolites in the cells. Various computational tools are deployed in functional bioinformatics to decipher complex biological information in diverse datasets to generate precise biological understanding and hypotheses about gene functions, protein expression, interactions and regulations in both health and disease. 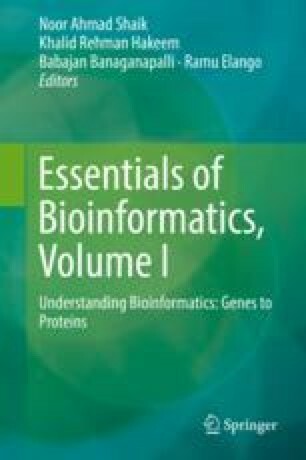 In this chapter, I will introduce the high-throughput technologies and the data analysis strategies currently used in the area of functional bioinformatics. This work is funded by the National Plan for Science, Technology and Innovation (MAARIFAH)-King Abdulaziz City for Science and Technology, The Kingdom of Saudi Arabia, award number 12-BIO2719-03. The authors also acknowledge with thanks the Science and Technology Unit (STU), King Abdulaziz University, for their excellent technical support.